A Saint in Our Midst: The Future Cause for Beatification of Father John A. Hardon, S.J. by Dr. Elizabeth A. Mitchell, Ph.D. I had the enormous privilege of meeting our beloved Father John Anthony Hardon, S.J., in the Fall of 1999, when he came to Milwaukee, Wisconsin, to accept the prestigious “Msgr. Popek Award” from our local chapter of Catholics United for the Faith. At the time, I knew I was meeting a saintly Jesuit and a holy priest. Little did I know that I was also meeting the man whose future Cause for Beatification I would help to assist, under the expert guidance of Raymond Leo Cardinal Burke, International Director of the Marian Catechist Apostolate. Over the years, both Fr. Hardon and Cardinal Burke have played an instrumental role in the guidance of my own family’s apostolate of Catholic education in the Archdiocese of Milwaukee. Fr. Hardon is honored as a Founder Emeritus of Trinity Academy, a K5-12th grade independent Catholic school established by my parents in 1997, and Cardinal Burke currently serves as a member of the school’s Advisory Board. The prayers and support of both Fr. Hardon and Cardinal Burke have encouraged and guided us in the running of the school and in facing the challenges of educating youth in their Catholic faith today—a catechetical mission so dear to the heart of Fr. Hardon himself. In the Fall of 2005, at a Eucharistic Conference being sponsored by the Real Presence Association in Chicago, Cardinal Burke discussed my potential involvement and assistance with a future Cause for Beatification of Fr. 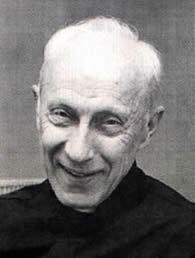 John A. Hardon, S.J. I had recently completed my doctoral studies in Church Communications at the Pontifical University of the Holy Cross, in Rome, during which time I had worked for various Vatican offices, including the Vatican Press Office, the Vatican’s L’Osservatore Romano newspaper, and the Pontifical Council for the Family. I understood the professional workings of the Roman Curia and spoke the Italian language with fluency. I had also spent a number of years intimately studying the life and canonization documentation of a modern day witness to the faith, St. Edith Stein, a Carmelite nun murdered in the death camps of Auschwitz during World War II. My response was immediate—of course I wanted to assist in any way I could with the effort! It was an honor to begin to help with Fr. Hardon’s Cause—but where to begin? With the help of the Marian Catechist Apostolate, and many of the lay faithful whose lives were touched by Fr. Hardon, the initial phases of the Cause got underway. In close union with the Vatican, the preliminary steps of the eventual Cause have been established. As often as Cardinal Burke speaks in wide and varied settings, he updates the faithful on both the progress and needs of the effort and introduces new people to the life and work of this saintly Jesuit. What can all of the Marian Catechists do right now to help in this wonderful work? So much! In the first place, His Eminence is extremely grateful for the support in prayer which each of us can make to this future Cause. Please include the progress of the eventual Cause in your daily Rosaries and Mass intentions. Please also remember to ask for Fr. Hardon’s particular intercession for your many needs and intentions, from the simplest problems to the most profound cares and sufferings. Fr. Hardon relied on prayer as the mainstay of his apostolic work and effectiveness. May we make him our model! Secondly, I would ask any of our readers who are capable with computers to assist in the large-scale transcription project currently being spearheaded by Carol Seydel of the Real Presence Association. One of the most important aspects of an eventual Cause will be the ability to submit to the Vatican, in written form, the texts of Fr. Hardon’s many preached retreats and lectures. We have many wonderful CD’s to transcribe – and the work alone blesses the worker with the fruit of meditation on the many timely and profound themes of Fr. Hardon’s teachings. Lastly, Cardinal Burke has been strongly advised by the Vatican to begin to gather a vast array of testimonials from those who knew Fr. Hardon during his lifetime, or whose lives were in some way affected by Fr. Hardon’s witness of faith. This is an enormous and exciting task. Fr. Hardon touched so many lives! All of this work is currently underway, and your prayers are most gratefully needed as the Cause develops. The completion of such a Cause may take many years but we can all rely on the profound intercession of Fr. Hardon himself, who so carefully watches over us all from Heaven. When I am able to share my work in this effort with people who knew Fr. Hardon intimately during his lifetime, they get a twinkle in their eye and say, “Oh, Fr. Hardon has put you to work, has he?” In fact, as I completed my own doctoral studies just after Fr. Hardon’s death, I prayed a novena to Fr. Hardon to ask him to show me how to use my degree in Church Communications to serve the Church. Apparently, he had a fitting answer! I am very grateful to use my gifts at the service of this Cause, and I hope and pray that one day we will have the blessing of seeing our own Fr. Hardon raised to the honors of the altar. Dr. Mitchell is currently the Director of Development for Trinity Academy and an Advisor to the Father John A. Hardon Media Apostolate based in Chicago. The Postulator for the Cause of Father Hardon is Dr. Andrea Ambrosi. He is assisted by Nina Bartulica. If you would like to submit a statement for Father Hardon’s Cause, please contact them by e-mail: avvambrosi@tiscali.it. Include your name, address, telephone number and e-mail address, along with a brief description of how and when you knew Father Hardon.